Since their 2003 beginning in San Luis Obispo, CA, Arvixe has been hosting individual and business accounts alike, experiencing powerful growth along the way. They offer a wide variety of hosting plans, including shared server, dedicated server and VPS plans, on both Linux and Windows platforms. Their reseller program is one of their mainstays, allowing you to customize and brand your own hosting while they do the management behind the scenes with their well respected service and support system. They do a sufficient job of taking care of my business. You might take a look at them. Love all the features, would not leave here unless they lose their grip. Have been extremely satisfied with all services. It's pretty good here, nothing really to complain about, just the usual hoops to jump through every once in a while. They do good work and are supportive. Loved that I could get so many features-hundreds- at the click of a button. I was pleased with the speed that support services returned info about my inquiry. This host is not overwhelmingly good but they have a lot of good features which are wonderful if all is functioning. But with that when I have issues they are pretty good about following up and resolving those. I am perfectly happy at arvixe even through some of the bumps in the road. They have typically been pretty consistent so am willing to move through any rough patches. They do have a lot of features. You can install like 450 applications with the click of a mouse. Suuport will get back to you when you put in tickets. They also will do live chat with support rtaff in realtime. I could not get a particular type of -TLD domain from them. I was able to get the domain that I wanted from someplace else and then used it with them. Today is the first time I've experienced the slowness on the servers as other reviewers have mentioned. Previously there had been no issues so maybe this is just a "today" thing and will resolve soon. I would still recommend based on total time here. 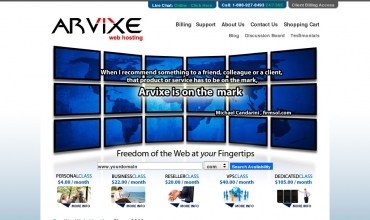 Arvixe is taking care of me so far, I don't have a large amount of work with them so my way might be easier than others. But from my perspective you could take a look at them if you are searching for a new host. I know arvixe is not perfect but from my experience with other hosts I am alright right now to hang out and see what happens. They do have some issues but have been responsive to me when I have contacted them. There has been some downtime that is not a good thing. The server does seem to move to slowly as well. When I have tried to get on "live chat" I had some difficulty. The 2 things that bother me the most is the slow sever and the inability to get any help with that through cust serv. My personal account with arvicxe is fine with no discernable problems. When dealing with my reseller acct I don’t have any issues so far. When I did have to deal with customer serv/support for my reseller account it was always professional. We have been making a profit and I like that.